Whether I am shooting suppressed or un-suppressed, I prefer to zero my 9mm subgun or AR9 at 25 yards. This is a good distance for the application of the weapons platform. Whether it is a home defense role or PCC competition, the majority of your targets will be with in this distance. You will still experience a sight over bore deviation. The varying degree of the deviation will depend on your mount height but most of your impacts should be with in +or- 1 inch of your point of aim if your target is inside of your initial 25 yards zero. The 115gr super sonic ammo gave me “point and click” capability out to 100 yards without having to hold over. The group with the UDP-9 did open up a little at 100 yards but this is a realistic result when using bulk ammo out of a decent barrel. The suppressed CZ Scorpion with the 147gr Aguilla produced point of aim impacts out to about 50 yards and then started to drop off as distance increased. At 100 yards my group had dropped an average of about 7 inches from my point of aim and opened up sizably. This drop is easily overcome by holding over your intended point of impact ad effective hits at 100 yards can still be attained. 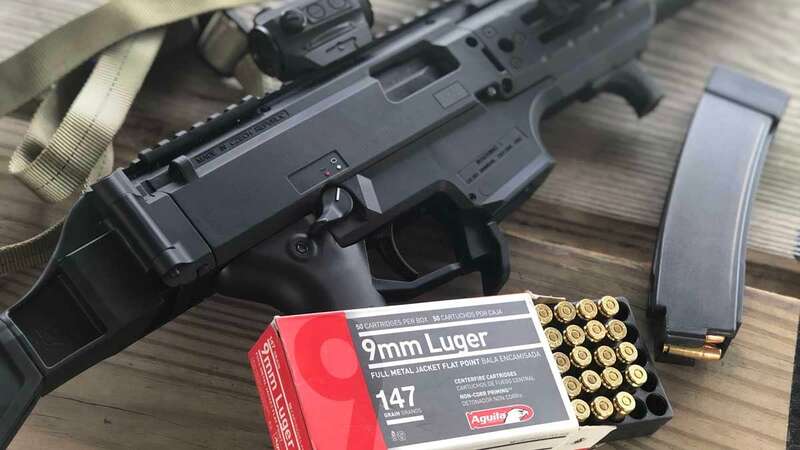 After 100 yards is when we start to see the 9mm substantially drop off and even more so with the 147gr sub-sonic ammo. However this does not mean the gun is useless now. This is when it starts to get fun actually. Super sonic rounds at 150 yards were roughly 18 inches low from my point of aim and at 200 yards the drop more than doubled to 40 inches. On a 24 inch tall BC style steel target from TA Targets I held at the top of the head to successfully land hits at 150 yards. At further distances I needed to hold my point of aim higher off the target but only slightly. Sub-sonic rounds were definitely a bit more challenging. Folks shooting suppressed with 147gr ammo will need to be a little bit more critical of their hold overs. Sub-sonic ammo can also produce a wide variety of results from brand to brand so make sure you test the sub-sonic ammo you will use. At 200 yards my point of aim was about 5 feet over the target but I still could hit 50 percent of the time. Now this is far from the genre of “precision rifle” shooting. But it shows us as long as we know the rate at which our 9mm drops and the distance we are shooting we still can make effective hits at un-expected distances. The 9mm in sub and super-sonic velocities is more than capable of breaking out of the 25 yard “comfort zone” that a lot of us constrain it too. So do not be intimidated by targets at further distances. Keep calm, adjust your aim, and send it!